In 1935 Fernando Luizzi published "La lauda e i primordi della melodia italiana", an annotated collection of well over 100 facsimiles with texts of a little-known corner of Italian mediaeval vocal music from the turn of the fourteenth century. It did much to shine new light on a style of singing, the lauda ("praise"), about which not enough remains known even now – despite the more recent Music and Merchants: the Laudesi Companies of Republican Florence by Blake Wilson (1992, ISBN-13: 978-0198161769). Although the two CDs of laude under consideration here were released in the winter of 2014, the performances were recorded in 1994 and 1997 for the Laude Di Sancta Maria (CD 1) and Legenda Aurea (CD 2) respectively. These are 17 and 11 self-standing works in Latin and Italian exalting the variety of religious experiences. They are performed in such a way that we feel convinced by the same faith as those originally involved must have felt. Though neither singers nor instrumentalists "lose" themselves in the pace or heat of praise. This balance is one of the recording's strengths. La Reverdie (from a poetic genre celebrating the return of Spring) was founded in 1986 by two pairs of young sisters from Italy (Claudia and Livia Caffagni, Elisabetta and Ella de Mircovich) to perform music of the Middle Ages and Renaissance. Doron David Sherwin joined them in 1993; Ella de Mircovich left in 2008. They all perform both as players and singers; and are augmented by up to a dozen performers as the repertoire requires… a total of ten is involved in the current two-CD set. The songs last from one to over thirteen minutes. With members as teachers, researchers and musicologists in their own right, La Reverdie is an ideal ensemble for the music performed here. They match enthusiasm for the songs as living music with a deep understanding of both the Italian literary origins of the lauda and how this genre ties text and music together. Additionally, their performance is informed by an awareness of where the lauda sits in the wider development of music. This development, in fact, was strongly influenced by social forces. The lauda developed as Italian society became organized increasingly in the communi. At the same time, monastic orders were founded that were less isolated than previously. Furthermore, the new artisan class in urban centers such as Florence needed (or were perceived as needing) a lay form to express religious fervency. So the "praise" represented by the lauda was understandably as often in the vernacular as in Latin. In fact, familiarity with the genre may enable us to answer questions about the (wider) spiritual needs of the guilds and merchants. The devotional imagery and imagination which are at the heart lauda seem to be analogs to achievements and experiments in the plastic and visual arts which drove the wider Renaissance. The seriousness (though never the severity) and rigor with which the performers here approach this music (which may remind you of both the chanson and the Minnesang, more than the earlier lai) are particularly appropriate. To respect the intention of the lauda is to add not merely to the supposed authenticity of the performers' work; but also to our understanding of its role, its appeal and its standing with contemporary performers and listeners. 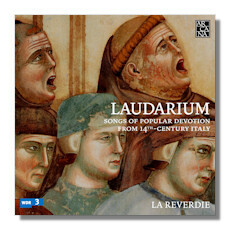 Specifically, La Reverdie enables us to hear the extent of the devotion, the commitment. It is never abandoned, wild. Never enthusiastic for its own sake. Still less gauche – despite a fervency that is perhaps easy to misunderstand or dismiss in the present century. The singing consistently reflects the fact that these songs had far more of faith and of prayerfulness than of entertainment. Also significant at the time in which this beautiful and evocative music was developing were the shifts from monophony to polyphony; from the unwritten to the written; and a larger place for instruments. Furthermore, the companies, or laudesi, formed to perform this music had a higher proportion of (lower) middle class members than might be expected. This represented a departure from, or at least sat outside the center of gravity of, musical development hitherto. So an awareness of the (historical) importance of the lauda is vital. But the performances here are all highly musical, rather than demonstrative, ones. The tension which the members of La Reverdie infuse into the structure of each song reflects, perhaps, an inevitable tension between the laity and the Orders and Clergy. Yet it results in a tautness of delivery (though never a gratuitous excitement) which adds to our reception of these works. La Reverdie also add immediacy in their performances by gently emphasizing the rusticity, almost roughness, which is at times afforded by use of the vernacular in these texts. Yet the articulation is clear and elegant. Despite being a reconstruction of the essence of the Vigilia alla Laude, the tone and sense of ensemble which permeate all the music here seem to approximate to the kind of ideal experience which participants and listeners might have had around 1300. You will hear energy, certainty, distillation of the evolving tonalities. Greater impact results than if these songs were for entertainment. Fortunately the performers can and do call upon a degree of contained spontaneity as well. Above all, theirs is music making that lives. The performers have a conviction in the belief that this particular incarnation of the text with the music must have served those involved in its original performance very well. In other words, there is a goal of as much authenticity as we can expect at the distance of 700 years. As well as a determination to let the fervor which was its original purpose find its own level… the singers and instrumentalists really enter into the spirit of the music. These recordings were made actually in norther Italy – in the abbeys of Santa Maria in Sylvis near Pordenone, and of Rosazzo near Udine. These are ideal; they offer the space and spaciousness which enhances our sense of the magnitude of the praise which these songs embody. The balance between voices and the minimal instrumental parts is varied, presumably for color and implicitly to enlarge our appreciation of the depth and breadth of the music. There are a couple of places (the very end of Voi ch'amate [CD.1 tr.5], for example) where edits make unexpectedly abrupt transitions. The booklet has a long and lucid essay by Livia Caffagni on the context and musical strengths of the laude with the aims of the musicians and musicologists involved in this project, as well as the full texts in Italian/Latin, French and English. Set in too small a font size for some with unnecessarily ornate "ch", "cl" and "sh" ligatures, it's also all available online. If this is an area of mediaeval music that interests you, you won't be disappointed in the way in which meticulous preparation and stylish yet restrained performance have combined to make an enthralling and historically important two hours twenty minutes of music making. Warmly recommended.